If you want to secure your home and the area around it, building a fence is a great option. However, if your property is close to your neighbour, communicating with them and considering their point of view in your decision can make the process much easier for both of you. A neighbour-friendly fence protects your home and your family, without making it appear as if you’re pushing your neighbours out. Here are a few things to consider if you want to have a good neighbour fence. Communication goes a long way, so even if you are only installing a fence for legal reasons, you should still talk to your neighbours. A good fence is more than durability, it’s also about aesthetics. If your neighbours have to look at a six-foot high chain link fence, they won’t be happy. 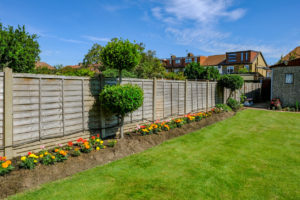 Choosing a fence that your neighbour is comfortable with, or even splitting the cost and choosing a mutually-pleasing fence are just a few ways you can make this decision one that makes everyone happy. The major reason for disputes when fence-building are because of concerns with the property line. No neighbour wants to feel as if part of their turf has been usurped. Make sure you are very careful about the location of your fence by checking the dimensions of your lot, observing any other markings around your property, and ensuring you have the necessary approval. If you and your neighbour decide to have the fence installed together, ask the fencing company if they can alternate finished sides, or split the cost 60 vs. 40 percent, charging more to the neighbour with the finished side. It’s also important to make sure that there are no discrepancies between you and your neighbour about maintaining the fence while you both live at the location. Are you located in Ontario and looking for a reliable company to build a fence that satisfies you and your neighbours? Are you unsure of the options available within your budget, but still want to transform the look of your exterior decor? Total Fence Inc. is a fully licensed fence company in Toronto, and we provide a myriad of beautiful options for our customers. Best of all, we do all the work from start to finish. Want to know more? Feel free to contact us with any questions.